The "Nature Island" Dominica is a lush green, mountainous island, located between the two french islands Martinique in the south and Guadeloupe in the north. The island is 50 km long and 20 km wide, the highest elevation, the Morne Diablotin, is 1447 m high. 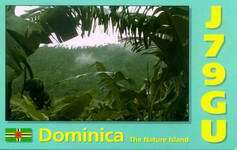 Dominica is wellknown for "soft tourism". You won´t find any of those big concrete tourist fortresses on that beautiful island. We hope that it may be left in that state for a long time. 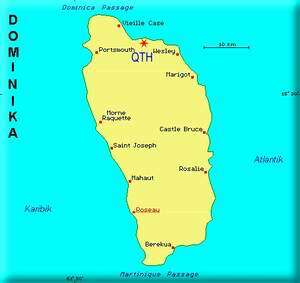 Send your application well in advance; 8 weeks before you enter Dominica should be enough (better more). Licence fee is 25 US$. You will get your license after arrival in Roseau in Mr. Cadettes office. Sea Cliff Cottages, Calibishie, a great place to be. One of the best DX spots, I have ever operated from. Lot of space for big antennas.